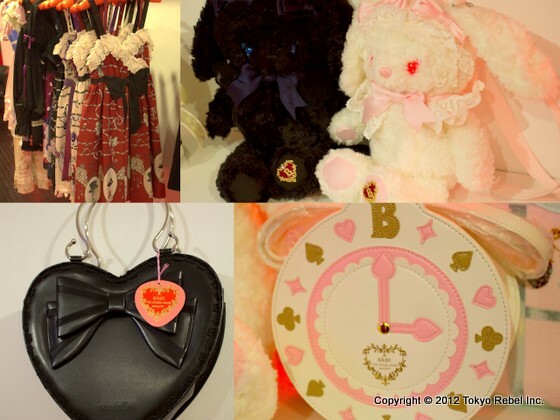 Tokyo Rebel: New and restocked Baby/AATP items, including Trick Hat, Pricked Heart! New and restocked Baby/AATP items, including Trick Hat, Pricked Heart! Yesterday we received a big box of items from Baby, the Stars Shine Bright and Alice and the Pirates, including the first batch of our Trick Hat, Pricked Heart series items! This is the brand new series from Alice and the Pirates that is still in the process of being released in Japan. 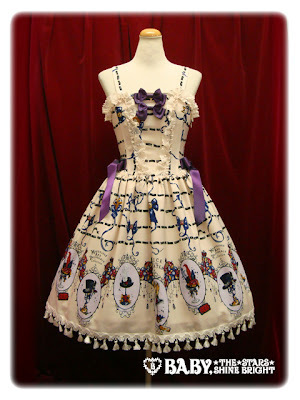 Our Trick Hat, Pricked Heart series items include both the baby doll and corset style jumper skirts in various colorways, as well as matching socks. Sorry, no skirts or headbows yet - so those of you who preordered those items will unfortunately need to wait a little longer. But they should be here soon! Those looking for a cute new bag for spring also need look no further, because we've got both Ribbon Heart Bags (these are very hard to get!) as well as the new Alice Watch Pochette in several different colors. The restocked Usakumya items are available online now - the rest will be available over the next couple of days. As always, you can pick any of these items up in store as well.